Connoisseur Cheese Basket From The Fruit Company. 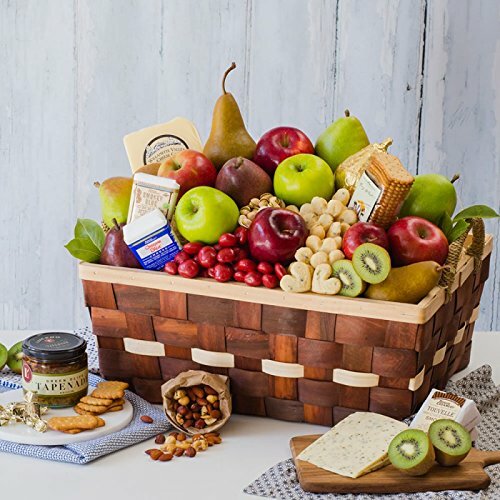 Cheese and Fruit Basket filled with a glorious combination of some of the world's finest cheeses: smokey touville, herb havarti, creamy gouda and tangy blue cheeses, harvest-fresh apples, pears, kiwis and plums with an assortment of sweet chocolate, cookies and nuts. They're all just part of this exquisite fruit and cheese assortment. 2-day shipping included. Harvest-fresh apples, pears, kiwis with an assortment of sweet chocolate, cider and nuts.